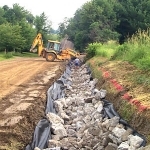 Grants administered by the Erie County Conservation District are available on a competitive basis to Townships to mitigate erosion and sedimentation problems of dirt and gravel roads. 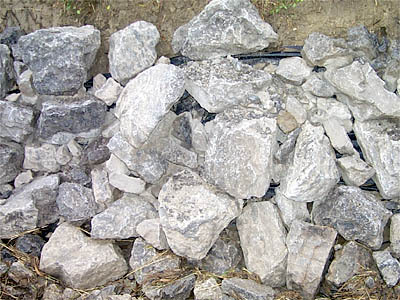 The Commonwealth provides funding for this program to all Pennsylvania Counties. 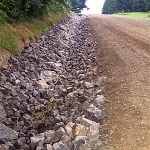 This year’s mitigation project was selected because the ditch pictured below suffered from high-water-flow erosion that ejected the eroded sediment directly into Goodban Run, a tributary of Little Elk Creek. 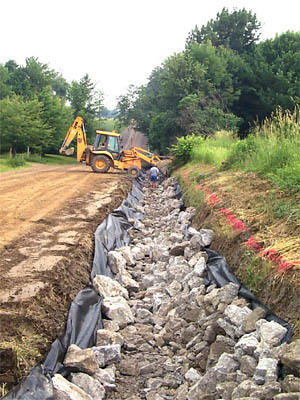 The remediation process begins with removal of native ditch materials and enlargement of the ditch profile to accommodate the placement of a layer of erosion control geotextile fabric under R-5 rock. 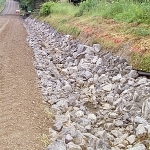 R-5 rock are 12-inch to 18-inch angular-faced limestone crushed rock that will remain in place as a ditch lining even when the ditch is flowing full with water. 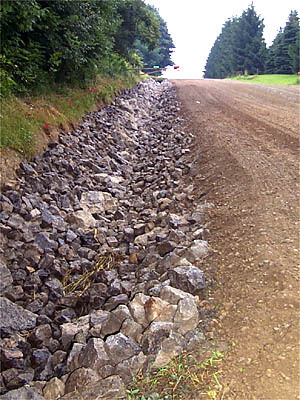 Besides stopping the erosion of the ditch, the rock lining provides the additional benefit of trapping sediment migrating from upstream. 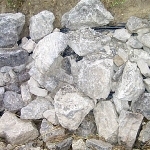 $7,100 in-kind contribution of labor and equipment by Franklin Twp. 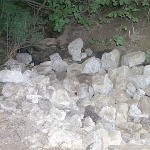 Pictured below (L to R): Running the backhoe is Rick Gould and doing the hand work in the ditch is Bob Schonthaler. 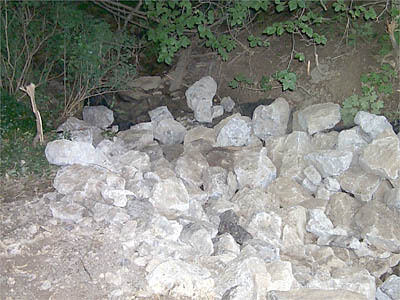 Large rocks at the outflow of the ditch that trap remaining sediment. 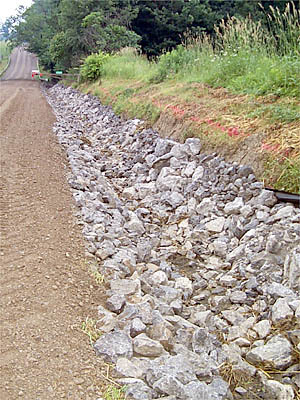 Large rock lining the sides and bottom of the ditch. Two shots of the finished project.